Samsung's arguably carried the crown of biggest, most beautiful TV screens for some time now—and if you've got $10,000, you can now buy the biggest, most beautiful, super-skinny of them all. This is a giant HDTV slice. The ES9000 features an expansive 75-inch screen with full HD and the obligatory 3D capabilities with just a .13-inch bezel. The series utilizes Samsung's proprietary micro dimming and black enhancing technology that provides "the highest contrast ratio on a Samsung Smart TV to date; a 30 percent improvement in sharpness and black levels; and a 60 percent improvement in brightness levels over the ES8000 series-supporting larger screen sizes and longer viewing distances," according to a company statement. Which will be necessary given that a screen that size is likely going to reflect any and all glare in the room. In addition, the ES9000 is being positioned as a potent entertainment and communications device. The set's razor-thin bezel conceals an integrated camera for Skype calls (which can be easily disabled when not in use, keep your 1984 hats on). 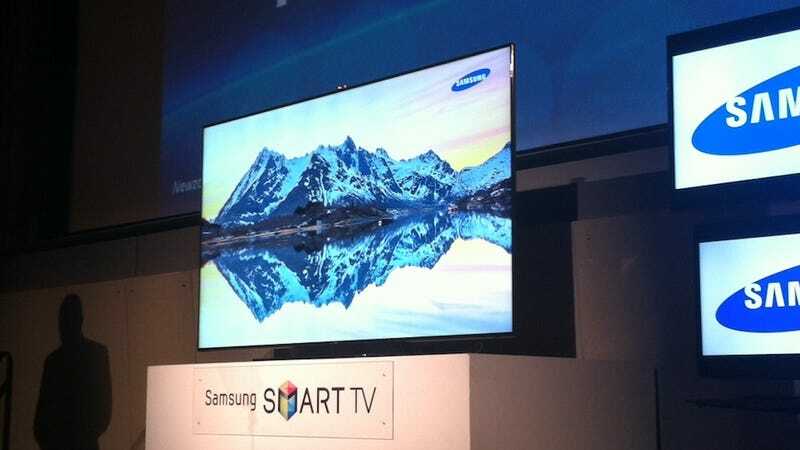 It also includes Samsung's Smart software suite—Smart Interaction, which replaces many controller-based commands with voice recognition and hand gestures; Smart Content, which allows premium content sharing between handheld devices and the TV; and Smart Evolution, which will silently keep the set's firmware up to date. In addition, the ES9000 is designed to automatically connect to a Series 6 or Series 7 wireless audio system over Bluetooth. You'll, of course, pay a premium to be to first on your block with an ES9000—it will retail for a cool $10,000 when it goes on sale in late August.